The $100 billion BRICS Contingency Fund, that leaders from Brazil, Russia, India, China and South Africa had approved last year to combat currency crises, will be operational in 30 days, the Brazilian Foreign Ministry said on Tuesday. Lawmakers from all five countries have now ratified their participation in the agreement. China will provide the bulk of the funding with $41 billion, Brazil, Russia and India with $18 billion each, and South Africa with $5 billion. 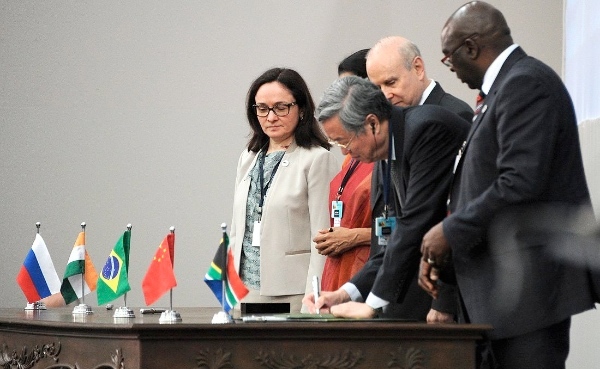 “The agreement aims to provide temporary resources to BRICS members facing pressure in their balance of payments. This instrument will contribute to promoting international financial stability, as it will complement the current global network of financial protection,” the Brazilian Foreign Ministry said in a statement. “It will also reinforce the world’s economic and financial agents’ trust and mitigate the risk of contagion from eventual shocks which may come to affect the economies of the bloc,” it said. Last year, during its sixth summit in Brazil, BRICS announced the creation of the BRICS Development Bank and of the BRICS Contingency Reserve Arrangement (CRA). “The establishment of a self-managed contingent reserve arrangement would have a positive precautionary effect, help BRICS countries forestall short-term liquidity pressures, provide mutual support and further strengthen financial stability,” South African President Jacob Zuma said earlier. The CRA is meant to provide an alternative to International Monetary Fund’s emergency lending. In the CRA, emergency loans of up to 30 per cent of a member nation’s contribution will be decided by a simple majority. Bigger loans will require the consent of all CRA members. Meanwhile, the $100 billion development bank, funded by BRICS countries, will offer loans to other middle- and low-income countries. Membership of the BRICS Bank will be open to all members of the United Nations, subject to agreement from the bank’s board of governors, China’s Vice Finance Minister Shi Yaobin said last month. “The promotion of reform in global economic governance has important and far-reaching significance,” he added. As the BRICS countries prepare to launch new financial institutions like the $100 billion BRICS Bank, the China-led Asia Infrastructure Investment Bank, and a $100 billion BRICS currency reserve fund, the IMF has once again delayed voting reforms to give emerging countries greater say. A statement from the International Monetary Fund last month said the board has postponed the discussion on how to move forward without Washington. BRICS leaders Vladimir Putin, Xi Jinping, Jacob Zuma, Narendra Modi and Dilma Rousseff are meeting next week in the Russian city of Ufa for the 7th BRICS Summit. Likely the Yuan / Renminbi. This currency is currently considered by many investors as the most stable. What I am hoping is, as new member countries join the BRICS Development Bank, they will contribute their share of funds under an asset based system. This would allow member countries to have a fair exchange rate to the Yuan. monopoly about their dollars and sanction.Pls.Ecourage my country NIGERIA to join. I come from Greece and I presume you are aware of our struggle to stop austerity measures that have destroyed our country. We were extremely happy when we read that our country was invited to join your bank. It’s two days before our plebiscite and the whole Europe seems to try and sway us to vote for YES. Their latest trick (?) is to say that Rusia denies that they ever invited us to join BRICS. I hope you understand that we desperately need to keep up our hopes that we can have a different future; one of self respect, dignity, progress and a brighter future for our children here in Greece and not abroad (as my sons are at the moment). Your country needs to vote NO! Become an independent state again…free your central bank from the clutches of the Euro Central bank, so your gov’t can access interest free loans and provide a future for Greece. A yes vote will bring nothing but suppression and poverty. I am from Canada, and since 1974 when our publicly owned Bank of Canada became a member of the “Bank of International Settlements” BIS, the financial mandates ( which were part of our constitution) of our central bank have been overwritten by these private bankers. Ony one thing i want to say to u & Greek people it’s the people who make a nation. You people are peace loving, republic democratic people.You people are greats hosts for tourists.I can’t see you people getting bullied by EU & IMF for money. Just take a pledge from now on you people are not going to beg for single penny in front of anybody whether it’s IMF,EU, WB or BRICS bank. This crisis is because of u r in EU so that is infested by them so whatever ur asking for is your right u people are not beggar like what these EU bosses are showing to the world. Please vote NO.Come out of the web & regain ur position politically & economically. I don’t think that it is such a straightfowrard issue. Greece’s participation in the Eurozone, through bailout programs, comes with its obligations. It would be irrational to demand the German, Finnish, French or Italian taxpayer to forever pay for Greece. It is a sad story the country is mixed up into, but believe me when I tell you that it is NOT, NOT, NOT compated to a complete and uncotrolled bankruptcy. Work hard, put pressure on corrupt politicians to do STRUCTURAL REFORMS and eventually, a brighter day will come. off topic but you should know that 92% of these money went to insolvent greek banks that received capital flows from major EU banks, solely because they were exposed to former’s debts. They never made it to the greek economy or the greeks. Even IMF stated three days ago that even if Greek economy grew to some 3% py, debt would still be up to some 140% in …2030. So forget about it. After all, it’s capitalism mate. You play, sometimes you win, sometimes you lose.